When Rex and I began to eat mostly raw foods there were times when we desired comfort food, and this usually took the form of steamed veggies or soup. If you're transitioning—eating both raw and cooked foods, and if you like beets, we think you'll love this zesty dish that's big on flavor! This recipe is both filling and satisfying, and is non-clogging to the body. It also makes for good travel food—so much better than fries, chips, or cookies. Beets are known for their liver purifying properties, which help to combat pollutants from city living, or when on the road or flying. Ginger is an anti-inflammatory that helps to settle the stomach and protect against motion sickness. If this dish is made the night before, the flavors meld beautifully, and will be ready to go in the morning to eat throughout the day. 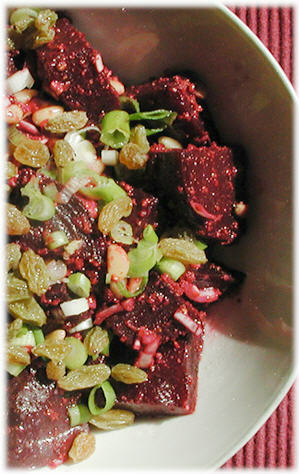 Ginger beets also make a delicious raw meal, and the cleansing properties will be even more potent. Simply shred uncooked beets using a food processor or by hand. Adjust the quantity of ingredients to desired amount. Garnish: finely chopped green onions, black pepper, stoneground mustard. Scrub beets, remove green tops (use for green smoothies or juice) and remove dark spots. Cut into pieces, about one inch in size. Rinse leeks and ginger. Remove any bad spots from ginger before grating. Place beets in steamer tray, and cook over medium-low heat until just tender, about 15 minutes. Add pine nuts, leeks, ginger, raisins, orange zest, olive oil, vinegar, and salt. Serve, or cover and place in fridge overnight. Adjust seasonings before eating, adding more vinegar or salt if needed. "It seems that all is at a crossroads. Do you, too, sense a barrage of forces nudging you to make lifestyle changes in order to cope with what lies immediately ahead? In almost every aspect of my life I feel the need to reevaluate and further "naturalize" my way of living." 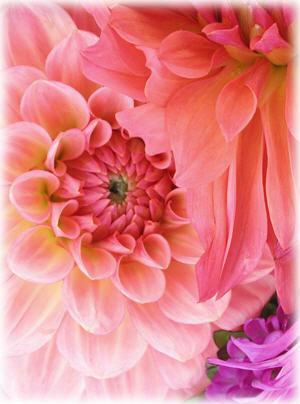 David Klein, PhD, Executive Editor of Vibrance Magazine, wrote those words in the 2008 Spring edition. The publication provides a conscious overview of what's happening with our global crisis, and provides a hopeful yet honest vision with suggested solutions for what we can actually do. David's realization mirrors our feelings, in that every day we awaken to something new that becomes a catalyst to bring positive changes into our lives. Rex and I have found that our diet—green juices in particular—have helped us immensely to stay in balance while navigating the transformative waters that we are all in the midst of right now. A nutrient dense whole food diet feeds the body with restorative nourishment that in turn creates calmer emotions and even illuminated states of consciousness. This is a boon during troubled times when we need to stay clear and open so that we can listen to our intuition and know what to do! It took us weeks, months—even years, to fully adjust to the raw food diet. As we progressed with our transition we tried to focus on what we had actually accomplished, and not so much about what we hadn't yet done. Our daily spiritual practices—the inner weaving of light and sound that speaks directly to our hearts, to Soul, is the anchor by which everything in our lives is connected. Guided by our higher selves, transitions will come. Something truly remarkable is happening, and we have opportunities every day to go beyond fear, to push the boundaries of our comfort zones, and embrace the unknown. Let us dream with exquisite beauty and purpose.